Ignatius Martin Perrish has a hellish life (he,he). Within the past year, his girlfriend, Merrin, was brutally murdered and his small town has turned against him. Once a devout Christian man, Ig has a fierce hatred towards God. Then one day he wakes up with horns. The horns have a strange power over people. When they see the horns they begin to spew out information that they would otherwise keep to themselves. For example, Ig's current fling admits that she fooled around with her ex the night before. As Ig attempts to get help for the spontaneous growth on his head he is pin-balled around town by neighbors who hate him and wish him dead. He seeks respite in his family home only to find that they all despise him. All except for his brother, who confesses that he knows who killed Merrin. The book then skips back and forth between present and past. It is within these flashbacks, that Hill develops Merrin as a character. However, even the character aspects of Merrin are told through the memories of Ig and his friend Lee. It can bring a bit of a confusing picture of her. At the end of the book, I do feel that she is fully developed. I found myself begging the author to let Ig and Merrin be together. I know she's dead but then again, he's the devil, or at least a devil. Also, apparently a side effect of becoming a demon is that snakes LOVE to be around you. At one point I screamed "NIGHTMARES!!!" and closed the book. Shudder. Joe Hill is a fantastic writer. I was completely enthralled with this book, outside of all that snake business. Hill reminds me a lot of Chuck Wendig, if you like one, then I highly suggest the other. 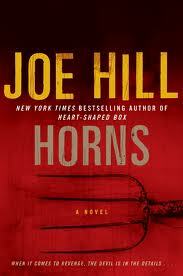 To find out more about Joe Hill, follow him on Twitter.